Coming shortly: a spur to living a healthy life, especially if you are one of the golden brigade. Golden Days Tea Party: everyone who came had a lovely time. The afternoon that had been organised by Councillor Pat Hearn, assisted by her husband Philip and the Hampden Park Eastbourne Homes Panel. went with a swing. 60 Years- We have made it: what an achievement. Come and celebrate with us on Saturday February 16th at the Community Centre, Brodrick Road, 2-5pm. as the guests of the Community Centre Association. Tidy up day:would you like to see the Park tidier ? Here is your chance to lend a hand. On Sunday 13th Jan you can join the clean up gang meeting at the park café at 10.45am and from 11am until 1.0pm there will be a clean up campaign around the Park. Sacks and pickers will be provided. The more helpers, the better the Park will look. Carols by Candlelight: at the Gateway Centre on Wednesday 19th December at 7.0 pm Door open at 6.30pm with free entry . Its Panto time : the Spotlight Players are presenting “Sinbad the sailor” on Friday 7th December and Saturday 8th December at 7.30pm at St Marys Church Hall Decoy Drive and also the 8th and 9th at 2.30pm. Autumn event in Tugwell Park: this coming Saturday Oct 13th there will be a fun packed day of family fun. With a wildlife I-spy trail, sports and games, roated chestnuts, toffee apples, craft stalls, apple bobbin, face painting, bird feeding, bulb planting refreshment and free fruit, all this between 1-3pm, Tugwell Park is in Wllton Avenue, easy to find, so come along and have some fun. Secrets of Hampden Park: come and learn all about them for only a fiver on Monday September 3rd, 7pm at the Community Centre, Brodrick Rd. 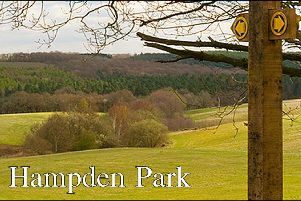 What do you know about Hampden Park ? : come to the Community Centre Brodrick Rd on Monday September 3rd at 7pm to hear Alan Wenham give an illustrated talk about the history of Hampden Park and the village. It is only £5 admittance which includes a glass of wine, or squash, or tea or coffee. Eastbourne Homes Panel: the next meeting of the tenants and residents panel is this Friday August 3rd. at the Community Centre. Open to anyone living in Hampden Park.